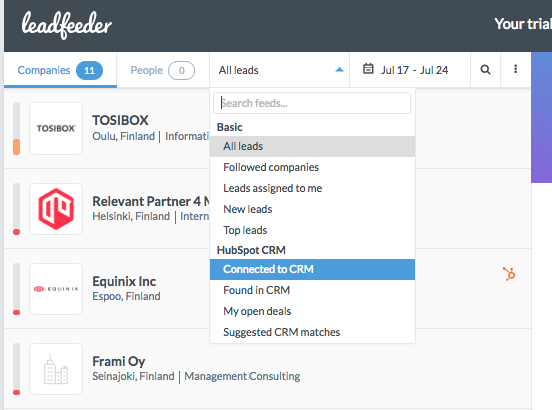 Once you've successfully integrated Leadfeeder to your HubSpot CRM, you can connect Leadfeeder leads to Hubspot CRM companies and deals. These can already exist in HubSpot CRM or you can create new ones directly from the Leadfeeder UI. 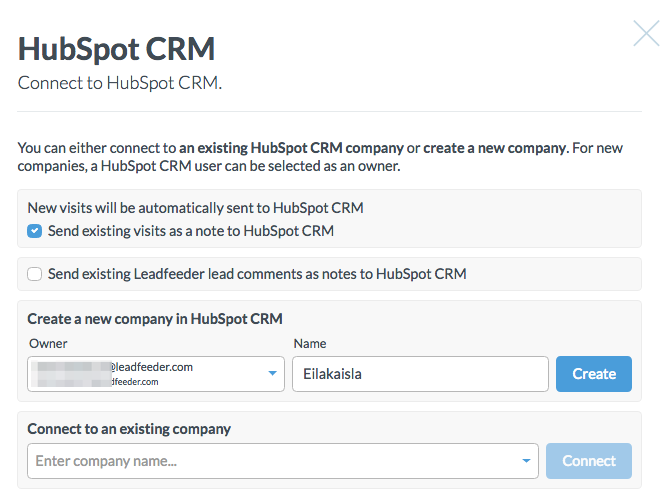 STEP 1: Take an interesting lead from Leadfeeder to HubSpot CRM by clicking on Connect to HubSpot CRM as company. NOTE: In most of the cases Leadfeeder's Automatic Matching will connect Leadfeeder leads to your existing Hubspot companies. STEP 2: After connecting a lead with HubSpot CRM, visits will appear like in the screenshot below as notes. By clicking on Expand more details will open up. Filter Leadfeeder leads based on their status in HubSpot. Notice also new filtered leads lists being generated at this point.